There are few things more relaxing than sitting on the dock, listening to the gently lapping water, breathing in the vistas, and dipping your toes in the water. Indeed, the dock is the new it-spot for getting together on the water. More than just a landing pad for coming out of (or going into) the water, the dock is a place that more and more people are using as a multipurpose outdoor space to fish, boat, dine and gather. Show your children the constellations on a clear night. Have s’mores from the fire pit on the first weekend of fall. Do a little night fishing. Have a glass of wine and enjoy the sunset. Grab a blanket and curl up with a book by flashlight. Look for shooting stars and make wishes. Check online for expected meteor showers, and have a meteor shower party. Bring out the guitars and some local craft beer (or root beer) and have an oldfashioned singalong. 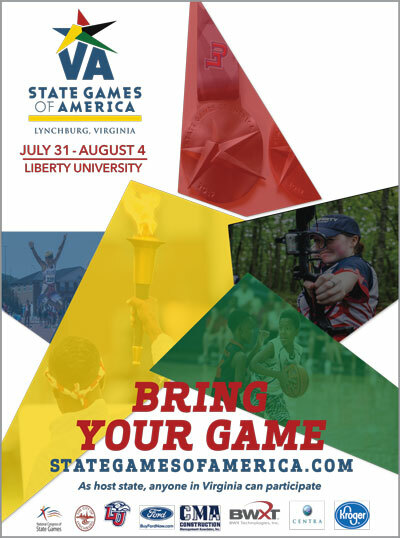 Play a game of cards—you can even play “go fish” with the kids to keep the theme! To outfit this outdoor structure, approach it the same way you would approach furnishing the inside your home: Size it up and determine its purpose. Aside from viewing your pier as simply a place to access the water, think of all the other possibilities the landing has to offer. Do you dream of having a quiet place to read a book, a spot for quiet al fresco dining, or a place to have a picnic or a party? Take some time to consider how you and your family would most likely enjoy this kind of spot, and measure it to figure out how much space you really have to work with. This is the time to be exact; oftentimes docks are smaller than traditional rooms or decks, and inches become precious. Bring these measurements with you into stores as you hunt for whatever furnishings you have in mind. Whichever way you choose to treat it, this isn’t the place for formality; comfort and durability are the names of the game here. Be certain that your outdoor furniture can withstand the elements of sun, wind and water, and don’t forget the benefits of laying down an outdoor rug or carpeting to protect your feet from splinters and heat. A dock used for relaxation purposes begs for cozy perches, like a couple of Adirondack chairs or a hammock. On the other hand, a dock for parties and occasional dining requires a table or two along with places to sit. 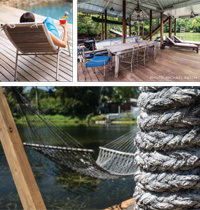 Whether you want to dedicate a section of your space to serve as your own personal tiki bar or as a floating-on-the-water dining room, choose the best seats for the purpose at hand. You might be content with a traditional built-in dock bench, which lends itself well to an L-shaped dock, but if you plan to spend hours vegging dockside, you might want something plusher. 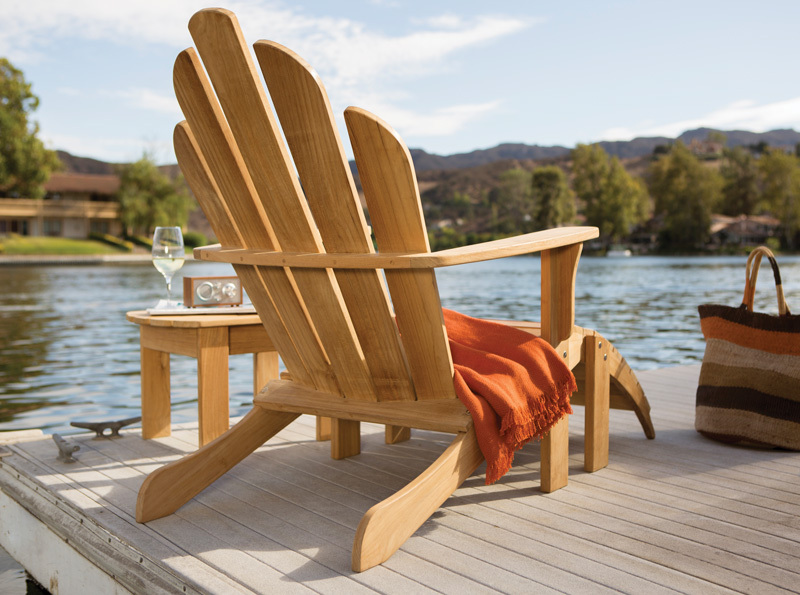 Some companies specialize in furniture just for docks—there are even new swivel chairs on the market that install at the edge of the dock, so you can have a comfy place to sit with back support while dipping your toes in the water— that’s the life! Don’t forget to furnish the space with a small table for your dockside snacks and beverages; if space is tight, garden stools can do the trick. If you love spending time right at the water’s edge, you’ll want some kind of protection from the sun. Keep plenty of waterproof sunscreen stashed away in a basket down at the dock for easy application—your guests will appreciate the thoughtfulness, and you’ll save yourself a trip back to the house. While keeping your skin protected from the sun is a must, you’ll also need relief from the heat at some point. Thankfully, there are a number of shade structures available in every price point, from pergolas with shade cloth to gazebos and canopies. Select the kind that meets your needs and your preferred aesthetic. You might also want to examine the different kinds of outdoor drapery on the market, which can provide protection from the sun as well as a sense of privacy and a dose of elegance to the dock. Whether your family spends hours in kayaks or whether you just want to take a dip to cool off, be prepared for having fun in the water. Since you’ll likely host a variety of guests, keep life jackets in a range of sizes on hand; these are a safety necessity when you’re out on the water. It’s also wise to keep lots of extra towels handy for yourself as well as your guests, who will especially appreciate the kind gesture if they’ve forgotten any gear. Store any towels, flotation devices, and watersports gear right on the dock in a storage box. The kind of box you use ultimately depends on how frequently you and your family get in the water and how much time you anticipate spending on the dock. If you plan to get out there on the daily, invest in a dock box that attaches to the dock to store all your stuff. And of course, remember to install lots of rod holders and a few extra poles for the fishermen and fisherwomen to use. 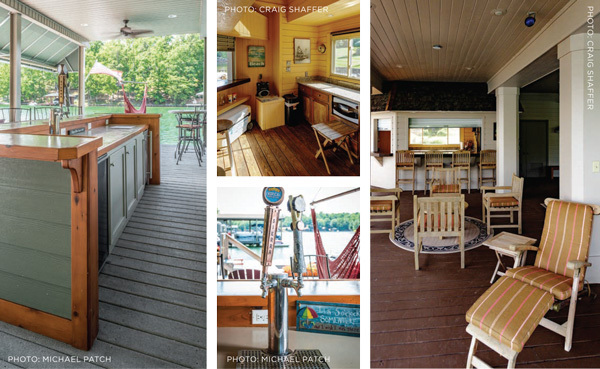 While you consider how you’d like to entertain on the dock, also take into consideration how far it is from your kitchen to the dock. Do you have climb what feels like miles of stairs to reach the main house, or can you get in and out in a matter of seconds? Do you want to have a small bar and countertop for preparing snacks and drinks, or do you simply need a cooler or some insulated bags? Would a mini-fridge work, logistically speaking? Take it all into consideration, and once you determine what works best with your style, stock up on bottles of water, sodas and sports drinks—and remember to grab a few of your family’s favorite non-perishable snacks (pretzels, nuts, chips) while you’re at the store. If space is limited, look into what it would require to install a pontoon picnic table near your dock (as long as this wouldn’t interfere with the actual docking of boats, of course!). From those picnics to cocktails, remember to forgo anything breakable (like china and glassware) or flimsy (like paper or Styrofoam). Melamine is the serving ware of choice: It’s sturdy, unbreakable, and won’t blow away when you set down your plate to excuse yourself for a moment. For drinkware, keep sturdy plastic cups (like Tervis tumblers) on hand—they’re perfect for everything from iced tea to piña coladas. When the sun goes down, that doesn’t mean the party has to stop—it just means that the party needs light! Again, the lighting you select depends on your taste and your budget. Custom accent lighting can include anything from paper lanterns to wrought-iron, farmhouse-style lanterns as well as string lights, LED landscape lighting, and hanging lamps. Provided that your dock isn’t in a shady spot, you might want to set up solar lamps to provide light for when the sun goes down, and look into installing solar dock marking lights to illuminate the edge of the dock in the evening hours. When you entertain waterside in the evening, the more light, the better—not only will it provide a warm glow, but it will also serve as a safety feature. If you really want to light up the water near your dock, install underwater dock lights—these are especially essential if you enjoy night boating or the occasional evening swim. Decorate to your heart’s desire; there are no rules here. 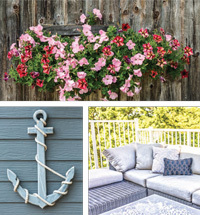 For some, peaceful and serene is the name of the game with teak furniture, a sisal outdoor rug; for others, a nod to all things nautical keeps things classic. It’s totally fine to even kitsch it up a bit if you want to impart a fun, whimsical nature to your dock decor. The way you approach dock decorating is up to you. Be sure that your decor can withstand exposure to the elements—especially the wet element! Bring out light throws in fun patterns to bring warmth to chilly evenings or mornings and to offer a splash of texture and color. You can even add a few pots of plants for touches of green; just be sure to stick a brick in the bottom of containers to make sure they won’t blow over out there. Citronella candles add a bit of a glow while also keeping the bugs at bay—and keep some bug spray nearby to keep the mosquitoes from biting your guests. You may choose simply to take in the vistas and sip a glass of something cold and sweet in the quiet of the evening, or you may invite friends to feel free to hop in their boats and come visit you by water. Whichever way you choose, you’re sure to enjoy using your dock more than you ever have before.